In this piece, Dial recalls one of the most horrifying specters in American history and consciousness—the African slave ship. iron bars, chains, and tangled fencing. The golden yellow ship sails are goat hide, a reference to the trade in human chattel, a cargo of human flesh, with a nation’s culpability remembered by the eerie presence of the U.S. flag hanging from the ship’s prow. 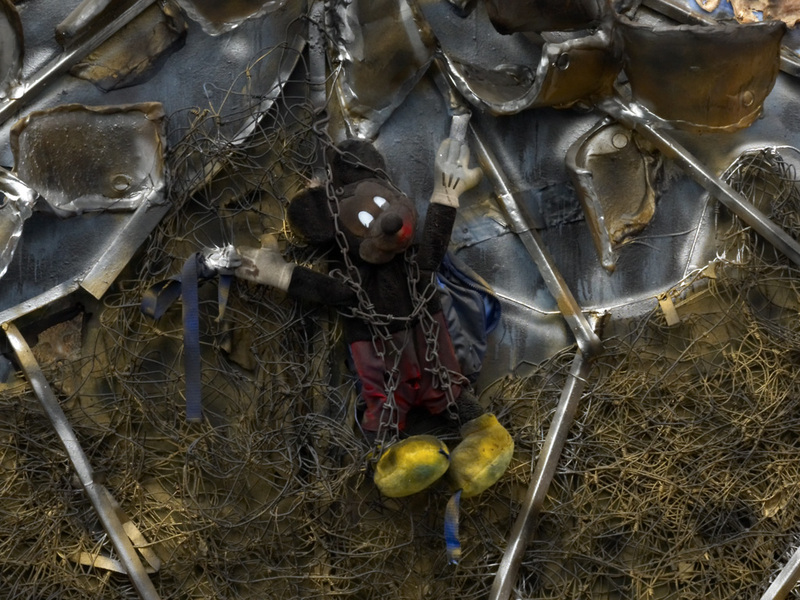 Chained at center is a disturbing and paradoxical figure: a stuffed Mickey Mouse. With a dark sense of irony and humor, Dial uses the pop-culture icon as a tongue-in-cheek representation of the slaves, imprisoned down in the ship’s hold like rodents, while the character's contradictory association with childhood play and innocence underscores the brutality of the event, It is also no coincidence that Mickey Mouse is himself black. Appearing here in a smudged blackface and with his traditional white gloves, the familiar figure takes on the additional identity of a black minstrel, whose self-lampooning antics once helped to promulgate America’s racist ideology, a ratting out of his own. Then again, Dial points out that black people survived for centuries by playing the cartoon figure to white world expectations. Acting the jester diffused racist aggression and masked protest. More than a form of enslavement, the black comic guise has been a transgressive rebuttal to its power.